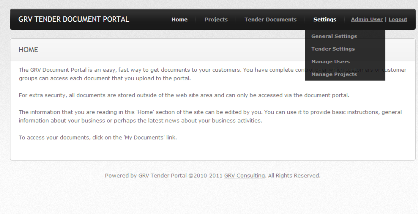 The GRV Tender Manager Portal application provides a fast, efficient and secure method to provide tender documents to your sub-contractors. Managing the delivery of tender documents to your sub-contractors has always been time consuming and tedious. The GRV Tender Management Portal takes care of the most time consuming areas of document delivery, saving you time and money. How it works is simple. You upload the document, set which contractors should have permission to download the document and then tell the document portal to send them an email notification that the document is available. GRV Development can provide custom portal development. We have developed several online applications in a range of industries that include features such as PDF report generation and access via smartphone. Please contact us for a quote. Deliver documents to your customers. You can save a lot of trees and provide 24/7 document access for your clients with our online document portal products. It's simple - your client logs in and clicks a link to download their document(s). Manage your mobile workers. Our web based mobile management applications allow your staff to create and update job details while they are right there on the job! All that is required is a web server and any modern smartphone that has a web browser. This is ideal for contracters, repairers, IT techs or anyone who does onsite work. All of our products include a full year of telephone and helpdesk support as well as free installation of any updates we make to the product.